OMG you can’t just post that without an explanation! Are they really orphans? Is there a wildlife group that can help? They are just too beautiful. Fair enough. These guys were left without a home when a substantial portion of my creaky tallow fell like an afterthought during the storm. The tree trimming guys were on their way when my wife spotted one owlet clinging to the tree, I later found another grounded beneath the broken limb. Elevation seemed like the best alternative to saws and neighborhood cats. Two larger owls swooped about while we moved the young, giving hope that they were not truly orphaned. Austin Wildlife Rescue will take them, but they and other sources suggest that leaving the owlets alone is preferred if the parents are around. 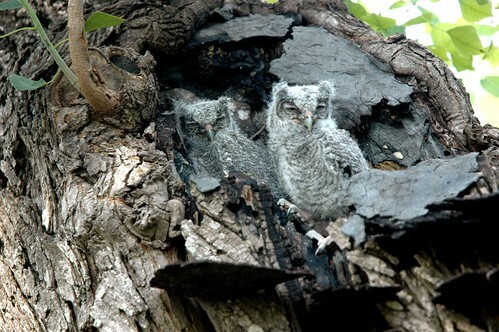 It was a gut-wrenching decision, but I left the owlets in the tree in hope that they were old enough to have a fighting chance out of the nest. As of tonight, one of the young is still in the vicinity, perched in a neighboring pecan tree under watch from a parent. The second is nowhere in sight, hopefully with the other parent.